The WaterCar Python is not one of those pokey amphibious cars from the 1960's. It can do 0-60 in 4.5 seconds on land, and up to 60 mph on the water.Total cost: about $220,000. In the late 1990’s, Dave March noticed that a number of design specifications between cars and boats were being shared. Boat manufactures were using lightweight high-performance automotive-type engines. Car manufacturers were incorporating light-weight marine-type composite and alloy bodies and chassis. Additionally, automotive manufacturers were using materials specially manufactured to be extremely corrosion resistant. 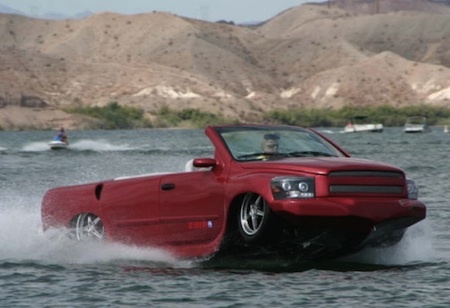 This gave Dave the idea of developing high-performance cars that could be driven on the water, and WaterCar, Inc. was born. 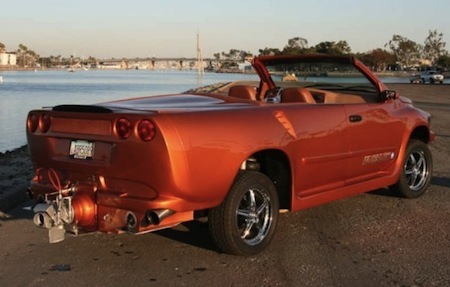 Dave’s vision was to see high-performance cars that were also high-performance boats. But he was not interested in previous amphibious vehicles that just float around. He was interested in designing a high-performance automobile capable of getting to plane on top of the water. His expectation was to reach freeway speeds in the water! His task was to incorporate the very latest materials and components into the optimum design for an amphibious vehicle. ...She reached again into the storage compartment, snapped something, and the back of the speed dial glowed, revealing another dial beyond. She studied it and made adjustments. Had there been a bystander, he would have been startled to observe what appeared to be a standard Camden rise up off the ground as easily as a skycar. He would not have long to wonder - the car moved out over the lake, dropped down to the water and sank beneath it. From WaterCar Python via Wired. Thanks to Jake for the tip on this story.